. 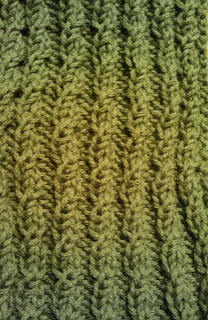 Knit So Simple: I love March ... it's Green! The older i get the more i realize that there really are some things that will always make me happy. The month of March is one such thing ... it's green.... everything about the month is green ... and green is my all time favorite color. I don't believe in luck but i do like clover .. 3 leaf clover, 4 leaf clover ... they're green! i've traveled to ireland .. it's green! i have fallen in love with the Celtic knots and braids from past days ... they remind me of Irish traditions ... Irish = green = me smiling! So this month i've decided to explore more the Irish/Celtic knots and braids, the color green and perhaps a few fun thing in between. So are you ready to tackle knitting and CABLES yet. If you can knit and you can purl then YOU CAN CABLE! Why not start with some worsted weight yarn and appropriate needles and then .... grab a cable needle (or a straw, or a pencil, or a chop stick - or anything that could be used to hold a few extra stitches along the way!) ... Don't panic, small steps and i promise it will all make sense! Not ready yet? Well, how about a small scarf to get you atleast thinking about cables .... but i promise no extra needles! PROMISE!!!! With size 9 needles, cast on 38 stitches using a Cable Cast On. Row 1: *P3, K2*, repeat to last 3 stitches, P.
Row 2 (WS): *K3, P2*, repeat to last 3 stitches, K3. Row 3: *P3, K2tog, pulling new stitch back through but don't take the 2 stitches off the left needle, next insert right needle BETWEEN the 2 knit stitches and knit the 1st stitch again, now slipping both stitches off left needle *, repeat to last 3 stitches, P3. 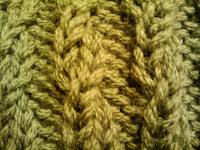 (can you see how the rows have a slight twist in the knit stitches, mimicking a cable but with no extra needle to use.... yet!) Repeat Rows 1 -4 for desired length. End with a WS row. I'm sticking with just one skein and am going to make mine more of a cowl/neck warmer length .. and i've got an amazing celtic stone pin that i'll be using as a shawl pin to keep the scarf closed and my neck nice and toasty. need more help? Visit the Pattern Drawer for more specifics and help with cast ons, cable techniques and more fun ideas for March.